Except as provided in Local Rule 83-2.1.3, 83-2.1.4, 83-2.1.5, and 83-4.5, an appearance before the Court on behalf of another person, an organization, or a class may only be made by members of the Bar of this Court. Active members in good standing of the State Bar of California may apply for admission to the Bar of this Court by completing an Application for Admission to the Bar of the Central District of California (Form G-60), submitting it online, and paying the required fee by credit or debit card at the time of submission. Applicants for State Bar membership who have passed the California Bar Examination, completed all other prerequisites for membership in the State Bar, and been sworn in to the State Bar, but who have not yet received a State Bar Number, may submit an Application for Admission to the Bar of the Central District of California, but be advised that such applications will not be processed until the Court determines that a State Bar Number has been issued to the applicant. (If you receive your State Bar Number after submitting your application, send an e-mail to cacd_attyadm@cacd.uscourts.gov to update your application with this information and expedite your admission.) Applicants must certify that they are familiar with this Court's Local Civil and Criminal Rules, and with the Federal Rules of Civil Procedure, Criminal Procedure, and Evidence. The Local Rules of the Central District are available at www.cacd.uscourts.gov/court-procedures/local-rules. Your application for admission to the Bar of this Court must be submitted online. Complete the Application for Admission to the Bar of the Central District of California, print it, and sign and date both the application itself and the Oath of Attorney. Electronic signatures are not accepted. Scan the signed application to a Portable Document Format (PDF) file, and then click the button below to complete the application process. Submission of the completed and signed Application for Admission to the Bar of the Central District of California, with the required fee, online, is all that is required. It is not necessary to be sworn in by a judge of this Court in order to be admitted to the Bar of this Court. 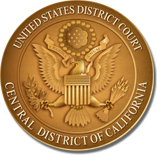 Note that if you participate in a group swearing-in ceremony organized by a law school or other organization in which applicants are sworn in to both the State Bar of California and the Bar of this Court, you must nonetheless submit a completed Application for Admission to the Bar of the Central District of California, with the required fee, online, or your admission will not be processed. For information on ceremonial swearing-in locations please see the California State Bar website at calbar.ca.gov. Your admission to the Bar of this Court will not be effective until we have received your completed application and payment, and have reviewed your application to ensure you are qualified for admission. Once your eligibility has been confirmed, you should receive your CM/ECF login and password within a few days. Your admission certificate should be mailed to you within approximately four to five weeks. If you do not receive your certificate, you may send an e-mail to cacd_attyadm@cacd.uscourts.gov.